So you’ve finally got your own apartment, but you’ve just moved in only to find that your lighting fixtures are harsh and unflattering bare bulbs! Well, don’t fret because Berlin-based Formfjord has an easy and recyclable quick-fix for your lighting woes. New Flat is a flat pack cardboard box that easily slips over your energy efficient bulbs, creating the perfect lampshade for any DIY lover. Ideal for even the most unhandy types, New Flat’s shades can be quickly assembled without a screwdriver, requiring just a little bit of folding! Wonderfully versatile, New Flat shades can be used as a temporary fix while you search for the right lighting to match the decor of your new home, or be kept as a kitschy permanent shade. 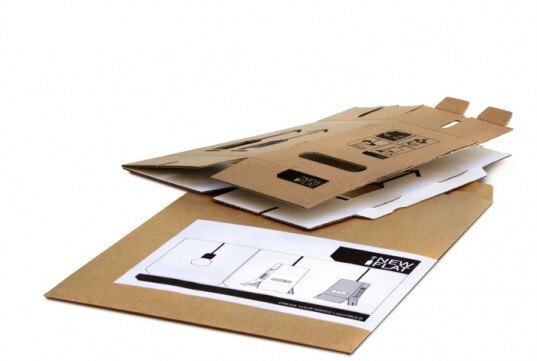 Either way, it can be easily folded into an A4 envelope or stowed away in a drawer. But best of all? Once it reaches the end of its useful life you can toss it right in the recycling bin. And for those whose tastes have graduated from cardboard to something a little more durable, Formfjord also boasts a wider array of innovative lighting and lampshades. I dislike the idea of it being just a temporary cardboard shade and nothing else. It would be good if you can use it to pack glassware, fragile items, or as an A4 flat, prints and then reuse it as a shade. So you’ve finally got your own apartment, but you've just moved in only to find that your lighting fixtures are harsh and unflattering bare bulbs! Well, don't fret because Berlin-based Formfjord has an easy and recyclable quick-fix for your lighting woes. 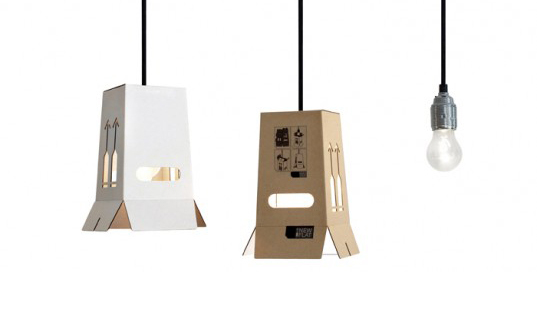 New Flat is a flat pack cardboard box that easily slips over your energy efficient bulbs, creating the perfect lampshade for any DIY lover. Ideal for even the most unhandy types, New Flat's shades can be quickly assembled without a screwdriver, requiring just a little bit of folding!